I am an interdisciplinary conservation scientist with an interest in community ecology, animal behavior, anthropology of human-environment relationships, and policy. I follow both a socio-ecological systems and a biocultural approach. My long-term projects include the restoration and rewilding of the "espinal" Chilean silvopastoral system, and multifunctional community-led wetland conservation in the Po Delta, Italy. I am also involved in a number of interdisciplinary collaborations linking natural history, biology, anthropology and art, with the Aarhus University Research on the Anthropocene group, of which I was formerly a member. As part of my research on conservation in Chile, I am currently working on two projects in addition to this one. One is funded by the National Geographic Society and focuses on building local capacity to conserve rare frogs. 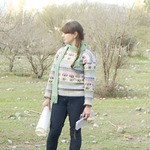 I am also starting a project on the conservation and management decisions of farmers in central Chile. I grew up in Michigan where I enjoyed all the animals in our backyard. Since then I have lived in the UK, Chile, Denmark, and I now live in Paris, France. Do guanacos eat the fruits of endangered trees? ¿Los guanacos comen las frutas de árboles vulnerables a la extinción? Nice photos! Thanks for the offer! That would be great. We will let you know. Daniela, thanks for your support! No need to be ashamed, I think crowdfunding is a new concept in Chile. I know lots of people are giving their moral support too. Hello Pablo, The 5 guanacos that we have continue to show anti-predator behaviours appropriate for avoided puma predation. There are very few pumas left in central Chile, and at the site in question there have been horses for a long time, including juveniles, with no reports of puma predation on them. The bigger problem is that guanacos are not good at avoiding feral dogs. (There are also no feral dogs detected at the site where we are working.) Feral dogs are a big problem in Chile for all wildlife, so a large-scale reintroduction of guanacos probably requires resolving that problem first. One way would be to find a legal way to control feral dogs in Chile. Another approach would be to test training guard animals, such as donkeys, which have been used successfully to protect livestock from predators in other contexts. We are going one step at a time. Hello Pablo, The 5 guanacos that we have continue to show anti-predator behaviours appropriate for avoided puma predation. There are very few pumas left in central Chile, and at the site in question there have been horses for a long time, including juveniles, with no reports of puma predation on them. The bigger problem is that guanacos are not good at avoiding feral dogs. Feral dogs are a big problem in Chile for all wildlife, so a large-scale reintroduction of guanacos probably requires resolving that problem first. One way would be to find a legal way to control feral dogs in Chile. Another approach would be to test training guard animals, such as donkeys, which have been used successfully to protect livestock from predators in other contexts. We are going one step at a time. Hi Agustín, Thanks for your comment. The Marín paper does show significant differences between populations of guanacos, and the meaning of those differences is that the populations are in the process of becoming subspecies. Despite some people previously claiming that there are four subspecies of guanacos, this paper finds no evidence of that. The paper states, "...guanacos exhibit a low genetic diversity for the cytochrome-b gene (p 1⁄4 0.01013) and the control region (p 1⁄4 0.00627), when compared with other related species with extensive distributions... we did not recover clustering of subspecies...We believe that this structuring [which does not support the claimed subspecies] might be due to fragmentation of populations (as shown in the distributional range of the species in Fig. 1) and isolation by distance...As we stated above, the structuring of northern populations may be due to isolation of populations in an initial phase of genetic differentiation." Consequently, I think there is an argument that the populations of guanacos in different regions should actually be connected genetically to facilitate gene flow, not further separated. But additionally, in our project, the 5 guanacos are castrated males, and will not be reproducing. If all goes well, we can consult carefully with experts and with SAG about what genetic background to introduce for reproductive populations. Hi Augustín, Thanks for your comment. The Marín paper does show significant differences between populations of guanacos, and the meaning of those differences is that the populations are in the process of becoming subspecies. Despite some people previously claiming that there are four subspecies of guanacos, this paper finds no evidence of that. The paper states, "...guanacos exhibit a low genetic diversity for the cytochrome-b gene (p 1⁄4 0.01013) and the control region (p 1⁄4 0.00627), when compared with other related species with extensive distributions... we did not recover clustering of subspecies...We believe that this structuring [which does not support the claimed subspecies] might be due to fragmentation of populations (as shown in the distributional range of the species in Fig. 1) and isolation by distance...As we stated above, the structuring of northern populations may be due to isolation of populations in an initial phase of genetic differentiation." Consequently, I think there is an argument that the populations of guanacos in different regions should actually be connected genetically to facilitate gene flow, not further separated. But additionally, in our project, the 5 guanacos are castrated males, and will not be reproducing. If all goes well, we can consult carefully with experts and with SAG about what genetic background to introduce for reproductive populations.